Washington State’s extended stay in college football’s nether regions has taken some of the juice out of recent Apple Cups. The prospect of the nation’s leading passer coming to Husky Stadium with the revived Cougars would certainly heighten interest in the annual grudge match with Washington, but it remains to be seen if Luke Falk will be on hand for Friday’s game. WSU’s workmanlike, 27-3 victory over Colorado was marred Saturday night when Falk was slammed to the artificial turf midway through the third quarter. Falk lay face down and motionless at midfield for some time. After several minutes, Falk was placed on a stretcher and taken off the court on a cart while raising both thumbs to the cheering crowd at Martin Stadium. “Luke’s an awesome player,” said Peyton Bender, the redshirt freshman who filled in for Falk the rest of the game. “He’s had a great year. Bender has displayed a strong arm, considerable potential and the usual signs of inexperience during limited action this season. Saturday, in his most extensive action, Bender completed 13 of 22 passes for 133 yards, one touchdown and one interception in temperatures in the 20s. “It came down to the wire,” Bender agreed. “I thought I was going to be the one, but I wasn’t, unfortunately. Marks added to the great season of the Cougars as a whole and himself as an individual when he caught a school-record 14th touchdown pass in one season. It was Bender’s second TD pass of the season, his first coming last week when Falk was shaken up against UCLA and temporarily left the game for concussion tests that he passed. 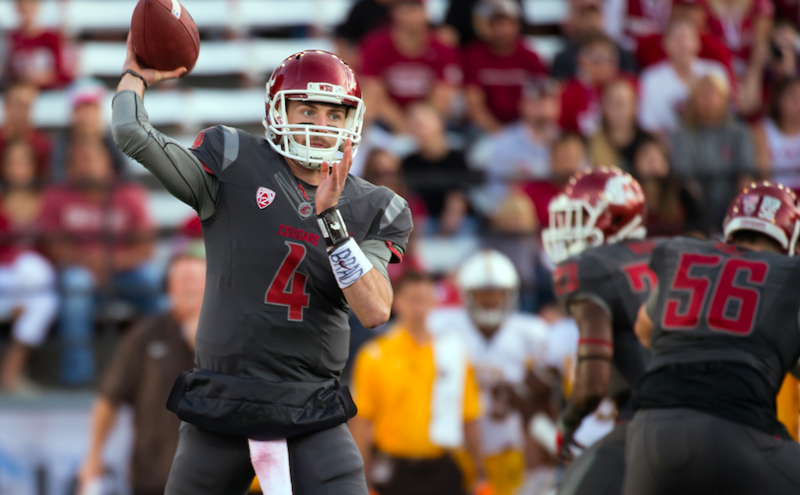 The Cougars (8-3, 6-2 Pac-12 Conference) have dropped two straight Apple Cups, and five of the past six. Washington (5-6, 3-5) needs to win the regular-season finale for both teams to reach normal standards for bowl eligibility, although it’s technically possible a five-win team may someday qualify for a bowl, since 80 of the 127 Football Bowl Subdivision teams now go to bowls. Marks, one of the greatest receivers in WSU history, lightened the mood in the press room when he playfully responded to a reporter’s claim that he’s not all that well known in Seattle. Marks also had some fun with his good friend Taylor Taliulu, WSU’s senior strong safety. After 44 games and 33 starts at WSU, Taliulu finally recorded his first interception in the fourth quarter. He returned the pick 42 yards. “You got nervous (on the return),” Marks told Taliulu. “Yeah, I did get nervous,” Taliulu admitted. “I saw you, you tightened up,” Marks said. Taliulu joked that he was “just waiting for Senior Night” to make his first interception. Taliulu and WSU’s 15 other seniors – including star left offensive tackle Joe Dahl, who wore a protective boot on his left foot when the seniors were introduced prior to the game – helped the Cougars dominate the injury-riddled Buffaloes on both sides of the ball.